I think it’s safe to say that long-tough winter is over. It felt seemingly never ending as were the bugs and illnesses that came tied with it. The weekend following Easter the little chickens came down with a norovirus. An afternoon out at the bowling alley turned nasty in seconds. Unfortunately non of us escaped the brutality of that virus, even the dog got puked on thanks to a lucky shot from Ava. My hope is that they don’t hit our household too often. Looking after triplets and Frankie whilst being ill ourselves was no joke. It was hard work. Thankfully it passed quickly. I’ve also been struggling with pain since my vasectomy and have managed to survive prescription painkillers, unfortunately they turned me into a dribbling mess so I haven’t been able to string a coherent sentence together so writing has been on hold. But I finally feel back in the land of the living. There is sunshine on the horizon, there always is. Last weekend brought a sunny warm day to Blighty so we loaded up the Babies and the bigger one and headed to the coast for the day. It was good to be feeling good and the babies love a trip out. We get bombarded by passers by still; but it’s hard to avoid the circus when it’s in town. 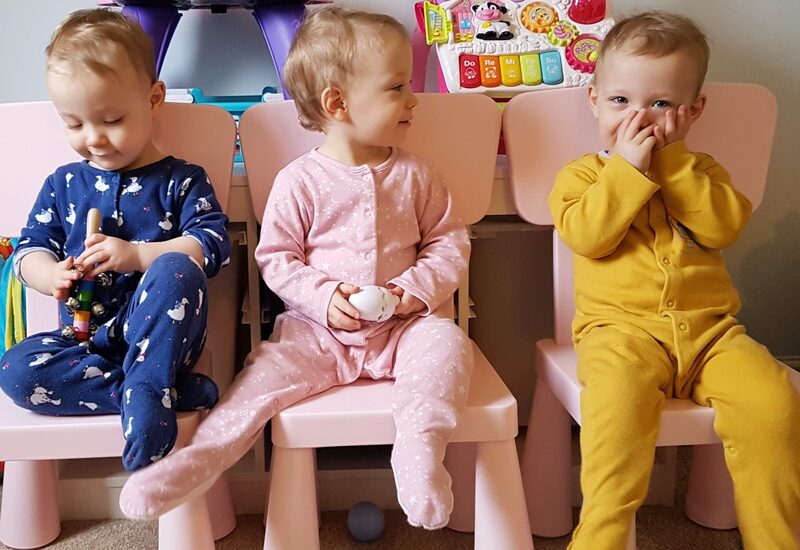 Since Easter, all three have teeth now, Lacey is sitting up unaided and the other two are not far behind. They remain healthy content little bambinos. Developing fast. They still sleep through 12 hours which blows my mind. I’m amazed at how happy they seem. It’s taken a lot of work and commitment from us both to keep them in a calm environment. Stacey is just phenomenal with them. As is Frankie. It’s been hard on her but she loves them to bits. A very proud big Sister. So we’re looking forward to some warm weather, good health, bbq’s and the triplets first birthday. The 4th of July will definitely be one to remember. Previous Previous post: Why the right to comment on mental health?